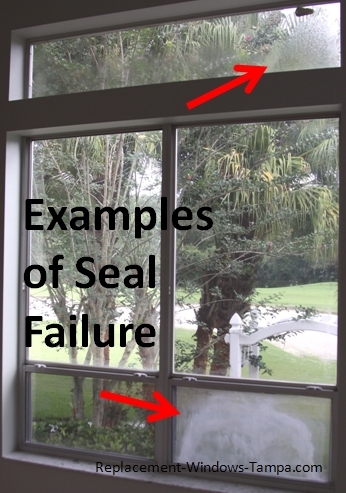 The biggest potential problem that comes with insulated glass is seal failure. When the seal fails, moisture creeps into the air space between the glass panes. There it condenses, and you no longer have clear glass to look through. It usually starts like a slight fog. Years ago when I first got involved selling insulated glass, I remember the pain one customer had. Her name was Agnes. She was a widow living alone in the house where she and her husband had raised a big family. Though she had no need for the big house anymore, she couldn’t bring herself to part with it. All her fondest memories were there, the Christmases, the birthdays, and even the wedding of her oldest son. It was home. When she saw her electric bills going higher month after month and year after year, there came a point she knew she had to do something about it. Florida Power, her electric company back then, did a free energy audit and suggested that among other things, she replace her 44 windows. I was General Manager of a National Window Manufacturing Company that had just entered Florida with the intention of dominating window replacement in the state. Our company got Agnes’s business and replaced her windows, all of them. She spent close to $40,000. The new windows, vinyl frames, double pane glass, with sashes that tilted in for easy cleaning looked beautiful. All her neighbors were jealous. Some of them ordered our replacement windows too. She lived near the shore, and traffic was just part of her life. She had gotten used to hearing rumblings of cars and trucks, the loud motor cycles, and the occasional ambulance sirens. She told me that the night after we had completed her window installation was the soundest she had slept in years, the windows did such an amazing job blocking all those sounds. The next morning, as she stood with her morning tea watching the sea gulls play as the sun streamed through her front windows, she told me that every other morning she used to pull the shades to stop the heat, but no more. About a month later she called to tell me how delighted she was to see over a $100 drop in her electric bill. She was excited. She’d call every now and then just to tell me new things she learned about her windows, like the first time she cleaned them, just tilting the second floor windows in and cleaning them all from inside. She acted like I was some long lost son. I loved it too. All her kids had moved away and had busy lives raising their own families, so I was delighted to be her friend. You know how good it feels to really help somebody, really change their life? I picked up the phone expecting to have a fun few minute diversion talking with her, but she had a problem. “Phil, my bedroom window looks blurry, and I tried to clean it, but can’t,” she said. Her bedroom windows were on the second floor at the back of the house. They faced west, so got the worst of the Florida sun. She told me she had cleaned the inside and tilted it in to clean the outside too, but the blurred area wouldn’t come clean. “It even seems to get worse in the afternoon,“ she told me. That was my first customer to have an insulated glass seal failure. I told her to keep an eye on it and I would find out what we could do to fix it. I was working for a huge National Company so they said they’d just ship another sash and replace the failed one, so I went to visit Agnes to make sure I ordered the exact sash with the insulated glass seal failure. I inspected everything and found 5 sashes with moisture between the panes, most just beginning to show the dreaded insulated glass seal failure. About a month later we had them all replaced. Another month after that she found the same problem in a second floor window on the front of the house, one facing east. From then on it was one sash after another. By the end of 2 years we had replaced every sash on the west side and most of them on the east. The south facing windows started the year after that. It was a problem that continued until the company left the state of Florida. There was little warning. They just pulled out. The failures were costing them thousands of dollars every month. I found myself out of a job. But the worst part for me was thinking about all those customers who had trusted us and had counted on their 50 year warranty, especially Agnes. The ordeal taught me that a window designed to handle the climate up north might fail miserably here in our harsh Florida climate. Unfortunately it wasn’t my last experience with an “up north” window design not making it here. Florida has special needs when it comes to windows. 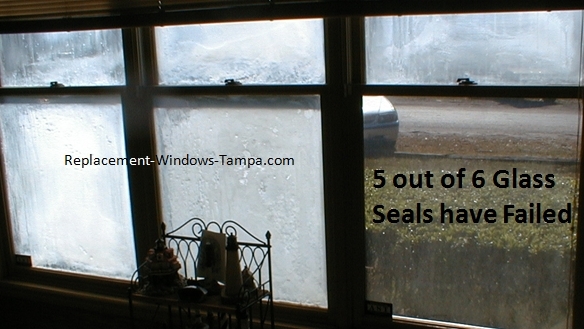 Insulated glass seal failure is their most common problem.